Made by J. D. Warren of Chicago, this solid oak 1900 era cabinet has 32 glass front drawers of various sizes. Made for a Wisconsin hardware store, this remarkable display fixture has old wavy glass fronts. The deep brown restored finish is in excellent condition. 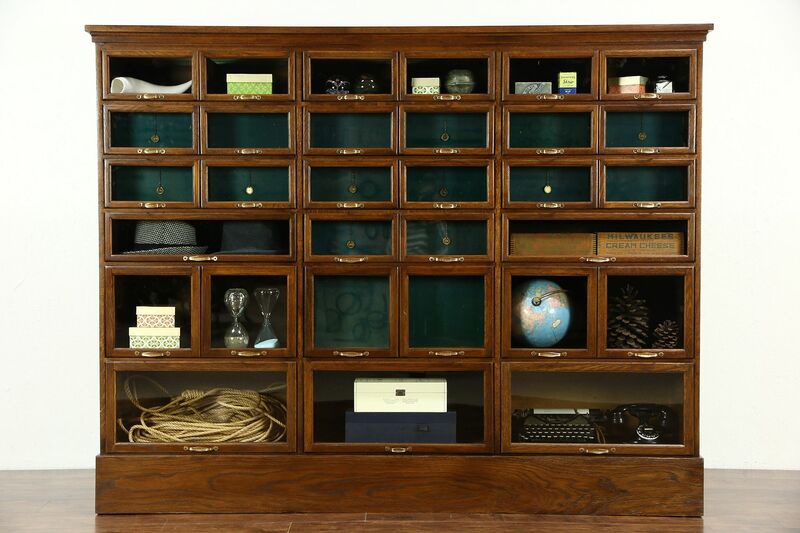 Some drawers have original sliding dividers to display contents behind the glass like a traditional "seed bin" or to divide the drawer into smaller compartments. Four different size drawers can be reconfigured as desired. This is a one piece cabinet and doesn't break apart, so measurements for delivery are important. Brass pulls are engraved "Warren" on this remarkable antique store furniture, useful for crafts or collections. The base has been rebuilt. Size is 78" wide, 17" deep and 61" tall.